Are You Prepared For BPCI Advanced? "Preview our BPCI-Advanced Diagnostic Tool"
Our data science team has developed an analytics solutions to help select and manage bundles under BPCI-Advanced. Using your historic CMS data and assigned target pricing, we can automatically analyze costs for each bundle. Explore variation, trending, and financial opportunities based on risk-adjusted data sets. To get you started, we'll help you answer your BPCI-Advanced selection questions. What bundle(s) should we select? Where are we already doing well? How have our costs been trending? How (and how much) can we improve? Our solution provides a dashboard summary, with recommendations for each of the 32 clinical episodes included under BPCI-A. Use data based on cost analytics to help inform your participation decision. 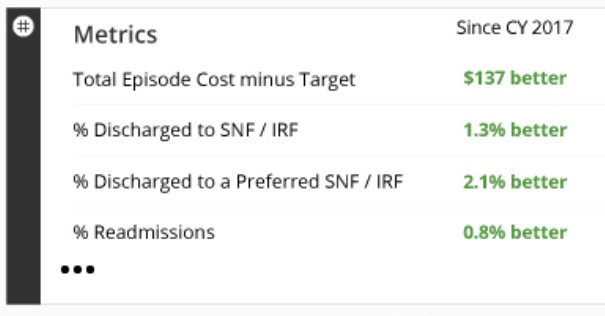 For each clinical episode, our solution compares your most recent CMS cost averages with the assigned target price. Use data to predict which bundles will provide the most financial opportunities and which ones should be avoided. By analyzing historic data by year, our solution summarizes the distribution of spending across the entire episode of care. Use data to determine whether or not utilization and costs have been declining consistently. With risk-adjusted CMS data, our solution calculates the financial impact of improving to the top percentiles for each bundle. Use data to target your improvement goals based on both local and national peer groups. Contact our BPCI-Advanced specialist Shelli Pavone to get started. Once you've selected your bundles and reported to CMS, it’s time to begin the work to reduce your current post-acute care (PAC) costs while improving the quality of patient care. Our newest PAC solution, designed specifically for managing BPCI-Advanced, will help you swiftly identify the opportunities to target your efforts. To provide ongoing insights, we'll help answer your BPCI-Advanced optimization questions. How do we take advantage of the CMS data? How are we doing / are we on target? Are we missing anything important? Whether it’s improving your discharge to home rate, reducing the use of skilled nursing facilities, or selecting the most cost-effective in PAC option, let real-time data inform your decision. With your CMS data automatically refreshed monthly in our easy-to-use platform, you will gain instant access to market intelligence, performance reporting, and episode management.